The 8×8 Cookbook Launches Today! 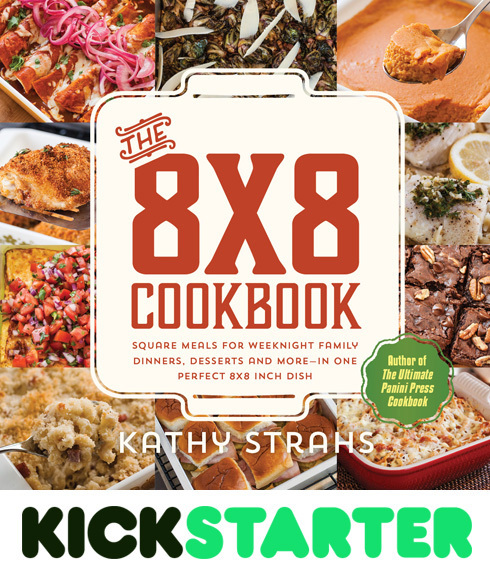 It’s the moment of truth—my Kickstarter campaign to launch The 8×8 Cookbook is officially live! As I announced earlier this summer, I started a publishing company this year, Burnt Cheese Press, LLC. The 8×8 Cookbook: Square Meals for Weeknight Family Dinners, Desserts and More–In One Perfect 8×8 Inch Dish is my first release, and it’s nearly ready to go to print. I’m aiming to raise $20,000 to make this project and this company happen — I would love your support! BACK IT on Kickstarter — Rewards include first edition copies of the book (autographed copies make great holiday gifts! ), an adorable “How to Make Mac ‘n Cheese” graphic tee for kids (designed by my 7-year old! ), the opportunity to join my Burnt Cheese Press Founder’s Table and even the chance to create your own professionally-produced family cookbook! SHARE IT on Facebook or any social media you like (my hashtag is #8x8cookbook). The website to share is: www.8x8cookbook.com/kickstarter Help me spread the word about the campaign to all who love to cook and eat, and let people know why you’re proud to support it! If possible, please make your pledge TODAY–the first hours of a campaign are super-important toward getting the most visibility on the Kickstarter site. All the details about the project (including a cool video!) are on the project page. THANK YOU SO MUCH FOR YOUR SUPPORT! 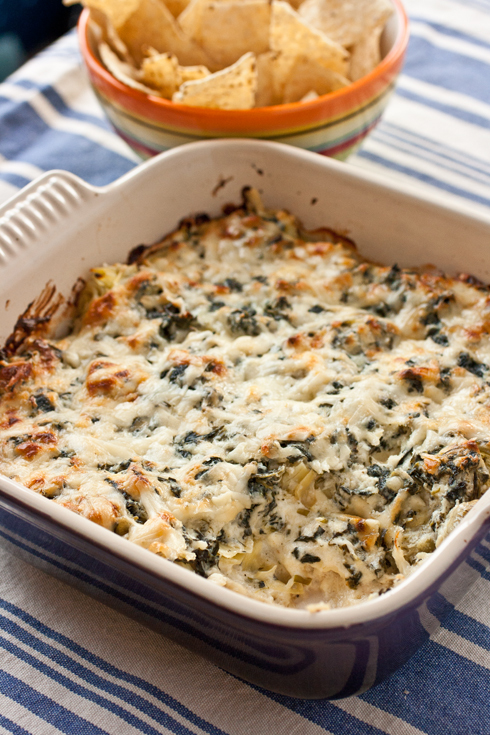 I’m sharing my Layered Spinach, Artichoke and Crab Dip, which is my idea of the ultimate hot dip. What goes faster at a potluck than a hot cheesy dip? Spinach dip, artichoke dip, crab dip — I love them all. I could never choose a favorite, and with this dip I don’t have to. I could mix them all together, but by creating layers I can taste each flavor individually (while still getting one epic combined bite). In a large bowl, mix together the Parmesan, ½ cup of Asiago, mayonnaise, sour cream, cream cheese, chives, lemon juice, salt and pepper. Spread ? of the cheese mixture on the bottom of an 8×8-inch glass or ceramic baking dish. Scatter the crab meat all over the cheese mixture. Spread ½ of the remaining cheese mixture on top of the crab meat. Squeeze any excess liquid or oil from the artichoke hearts, roughly chop them, and arrange them in a layer on top of the cheese mixture. Squeeze any excess water from the spinach, stir it in with the remaining cheese mixture, and spread it over the artichoke hearts. Sprinkle the remaining Asiago cheese on top. 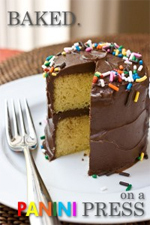 Cover the dish with foil and bake for 20 minutes. 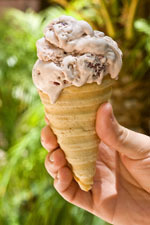 Uncover and bake until it’s bubbly and browned on top, another 25 to 30 minutes. Serve with tortilla chips. GIVE A GOOD SQUEEZE: You’ll want to get rid of as much moisture from the spinach and artichokes as you can so your dip doesn’t turn watery. An easy way to do this is to put a handful of vegetables in a doubled-up paper towel and squeeze until no more water comes out. SAY HELLO TO ASIAGO: If you don’t already cook with Asiago, allow me to introduce you to this flavorful Italian cheese that’s most likely at your grocery store. It’s a cow’s milk cheese, with a sharp, nutty flavor that will remind you of Parmesan. I often turn to it when I want Parmesan-like flavor with an easy-melting texture. A big thanks to Le Creuset for providing the beautiful Heritage 2-Quart Square Dishes for the 8×8 Blogger Potluck! So excited for you, Kathy! I’m not only certain you will meet your goal, but you will exceed it. Such a great book! Thanks so much for all of your support, Amy!! Previous post: What I’ve Been Up To — A Fun New Project and a New Company! Next post: Win a Le Creuset 8×8 Square Baker!